(From left to right) Kathleen Murphy, Tara Jabbaar-Gyambrah, Rebecca Borowski, Terri Budek, Caitlin Hoekstra, Rebekah Burke, Robin Sullivan, Teresa A. Miklitsch, Letitia Thomas, Katie Barnum and Liesl Folks attended last year's Women in STEM summit. The summit looks to inspire girls who are studying or may be looking for a career in the STEM fields. In the United States, women fill more than half of all professional occupations. Yet, according to co-founder of UB Women in STEM Cooperative Kathleen Murphy, less than 50 percent of all STEM graduates – those majoring in a science, technology, engineering or mathematics discipline – are women. During the last 10 years, Murphy said the percentage of women pursuing a professional degree in the STEM fields has remained relatively stable, with the numbers for women obtaining either a bachelor’s, master’s or doctoral degree in these fields at or less than 30 percent. UB is no different in its representations of these numbers. But action is being taken to bring awareness to these fields and increase interest among women. On April 13, the second annual Women in STEM Summit will be held in the Student Union. “We want to close the STEM gender gap by making STEM careers more attractive to women,” Murphy, manager of network and classroom services in UBIT, said. She said the event is an opportunity for “emerging and established” women in STEM to discuss common challenges and experiences, all while promoting accomplishments and inspiring new generations of women. For students like Meagan Hopkins, a junior chemistry and biotechnology major, this event is a step in the right direction. Hopkins’ interest in the STEM fields began in high school when she began taking upper-level science courses. She had a female teacher who helped guide her through the field and spark curiosity and interest in the sciences. “She had a very profound impact on me and taking her class was very critical for my decision to move into the STEM field,” Hopkins said. Many other women professionals in various STEM fields will be in attendance running workshops and paneling. New to the event this year are student poster presentations, featuring 27 aspiring women in STEM, according to Murphy. Terri Budek, associate director of the Intercultural and Diversity Center, emphasized the importance of inclusivity in relation to the event. “We are committed to empowering women in STEM by offering this type of program that provides engaging content, authentic conversations and an opportunity to network,” Budek said in an email. Budek said that she wants UB students to know that regardless of gender, this event is an opportunity to explore the STEM fields and advocate for a more diverse and inclusive workforce. Being a woman pursuing a career in the STEM field has made Hopkins proud to be a part of the “rapidly growing community” of women scientists. And she said, as far as what she has received from UB, the feelings are no different. 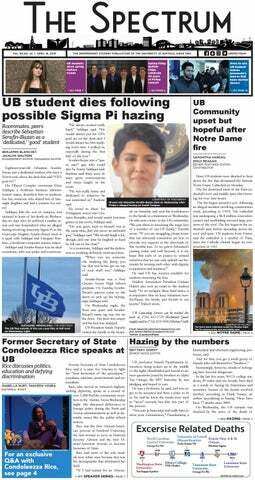 “I am extremely confident in my ability to find a job after leaving UB,” Hopkins said. She said given the well-known and respected faculty in the STEM departments – some of which are women – she feels well trained and well networked in her respective fields. The event starts at 9 a.m.